Over the years, Emerge staff have written various articles on many different topics. These articles may be useful for research papers, outreach, or as helpful tools for specific abuser group issues. All articles are listed by publishing date. If you have additional questions about a specific article, please call our office or send us an e-mail. "Why Do They Kill? Men Who Murder Their Intimate Partners"
Moving backwards from the murders they committed through their adult lives, relationship histories, and their childhoods, the author sought to understand what motivates men to kill. The patterns he found reveal that the murders were neither impulsive crimes of passion nor were they indiscriminate. Why Do They Kill? 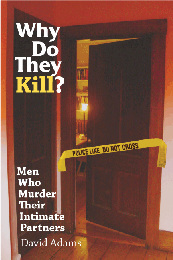 is the first book to profile different types of wife killers, and to examine the courtship patterns of abusive men. The author shows that wife murders are not, for the most part, “crimes of passion,” but culminations of lifelong predisposing factors of the men who murder, and that many elements of their crimes are foretold by their past behavior in intimate relationships. Key turning points of these relationships include the first emergence of the man’s violence, his blaming of the victim, her attempts to resist, his escalation, her attempts to end the relationship, and his punishment for her defiance. Critical perspective on the men’s accounts comes from interviews with victims of attempted homicide (standing in for the murder victims) who survived shootings, stabbings, and strangulation. These women detail their partner’s escalating patterns of child abuse, sexual violence, terroristic threats, and stalking. The section on help-seeking patterns of victims helps to dispel notions of “learned helplessness” among victims. parenting education and strategies for reducing client attrition. "Emerge: A Group Education Model for Abusers"
completion, cultural competence and community collaborations. "Running Batterer Groups for Lesbian & Bisexual Women"
issues specific to running lesbian group. "Safety Issues for Female Group Leaders"
Helping Their Patients Who Batter "
referring their patients who batter. An Attorney’s Guide to Clients Who Batter"
"Coerced Treatment: A Contradiction in Terms?" "Guidelines for Talking to Abusive Husbands"
discussion of common excuses by batterers. in couples and in groups. of the battered women’s movement. husbands in their sense of empathy and entitlement. "The Addicted or Alcoholic Batterer"
"Feminist-Based Interventions for Battering Men"
batterer’s programs on victims, perpetrators and the community. A Pro-Feminist Analysis of Treatment Models"